White ring neck doves (also known as "love doves") provide a beautiful added touch to any occasion. These love doves are meant for decoration only. Never use these doves for release, as they will die quickly and fall to predatory animals. White ring neck doves make great pets for people of all ages. 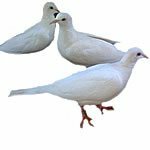 If you are wanting to fly birds at your place, you will want to purchase our White Racing Homing Pigeons instead. These birds are also used by famous magicians, illusionists, and have been utilized by theme parks across the USA. We only stock these birds in very small quantities during the spring, and fall months. Unlike our White Racers that can be ordered throughout the year, these beautiful white doves are rarely available for purchase after May of each year. The demand is much higher than our supply capability, so as long as you see the order link available, you're still in luck.